A early voting location in Hidalgo. AUSTIN — A sweeping Texas bill that would toughen penalties for election-related crimes advanced Monday over protests from civil rights groups who say it punishes voters with jail time for making potentially honest mistakes. Biery’s decision temporarily halted a failed search for illegal voters in the state, which began in January with the release of a deeply flawed list of 98,000 voters who were flagged as possibly not being citizens. President Donald Trump seized on the reports to renew unsubstantiated claims of rampant illegal voting. Within days, however, it emerged that the list wasn’t vetted and included scores of U.S. citizens. Under the bill, Texas constituents would face a “state jail felony” for providing any false information on voter registration forms, boosting the current misdemeanor penalty. 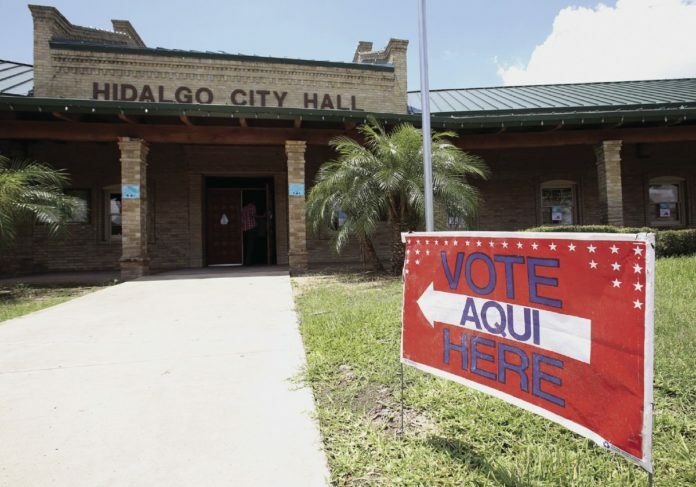 Another portion would require people who help constituents with transportation to polling places to complete a form stating the voter is physically unable to go without personal assistance or potentially damaging their health. It would mandate the use of an “audible voting system” for elections systems that creates a paper record for voters to verify their vote was cast properly. “We see SB 9 as overall an attempt to make it more difficult and confusing and scary for voters by imposing more red tape and bureaucracy on voters and election officials,” Slattery said.